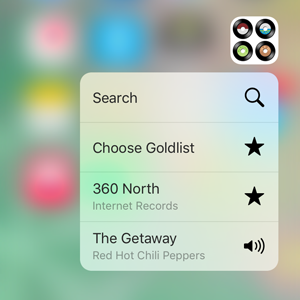 To get easy access to the main functions just use 3D Touch on the My Records icon. No 3D Touch in place? Most of the functions are available with the context menu which is also reachable for 3D Touch enabled devices... (more infos about the context menu). 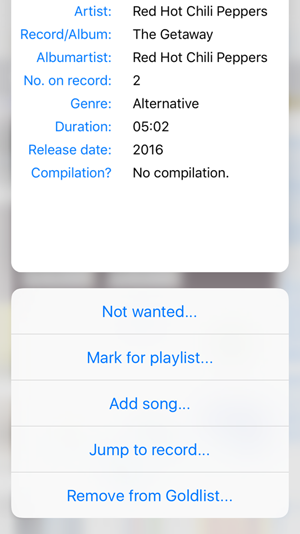 Using 3D Touch on a song or album (record) icon you get further information about it. Mark for playlist... mark song for a new playlist which you can create with this way and save it for later use (as a Goldlist) (further info...). Jump to record... jump visually to the record of this song (to a Goldlist section or main sections) (further info...). 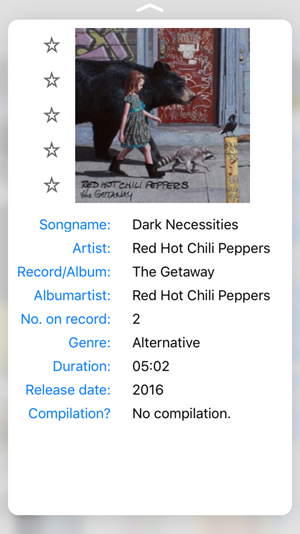 Remove from Goldlist... direct access to remove a song from a Goldlist (further info...).